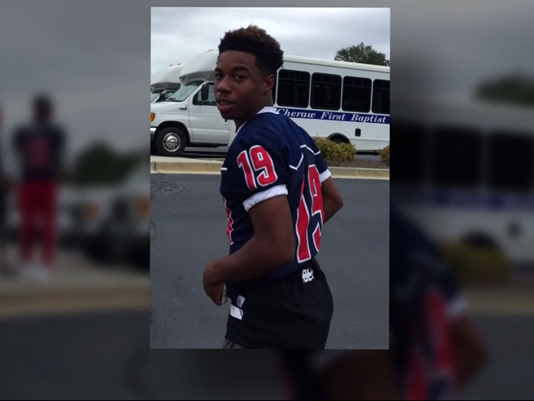 CHERAW, S.C.—A star Chesterfield County football player’s sudden death has left a community stunned. Cheraw High School junior, Dorrell McFarland, 17, went into cardiac arrest, according to friends. The teen was airlifted to Charleston where he died Monday. “Words can’t explain how I feel. He’s gone. My best friend left me,” said Nasir Mallory, McFarland’s teammate. McFarland won the starting corner position for the Cheraw Braves in his sophomore year and began transitioning to running back this spring for the upcoming season. “I know it’s going to be sad when we go into the locker room knowing Dorrell [is] not there with us,” said teammate, Quan Gillespie. McFarland had quickly become the heart of the team. His humor and electric energy became the spark to get his teammates to push through, even when their backs were against the wall. The Braves finished season 11-2. But putting on a brave face now difficult for this team now dealing with a loss they can’t come back from. “I never knew that I would lose my best friend, somebody that I be with everyday,” said Mallory. The cause of death has not been determined. The Chesterfield Coroner’s office did confirm they were conducting a child fatality investigation, but would not release any further details. Friends suspect it was a heart attack. The impact of McFarland’s death is being felt throughout Cheraw. “It affected the whole community. It messed up everybody. It’s hard going through not having him. He made everybody laugh,” said Mallory. Football season is still weeks away, but the Cheraw Braves say they will play with more heart than ever before. “I just know first game, I’m wearing his number,” Mallory asserted. “Every game we going to pray and we’re going to win every game for Dorrell,” Gillespie declared.